In last month's round up on developments in Sohm we gave details of the impact that generous donors had made as far as sponsorship, science equipment and bikes over recent months. This month, we'd like to turn to classroom and staff quarters accommodation, sports equipment and sponsored school visits. The Lower Basic school (primary) in Sohm was built about 30 years ago, and alongside it some pretty basic teachers' accommodation blocks for those working in this fairly remote village. 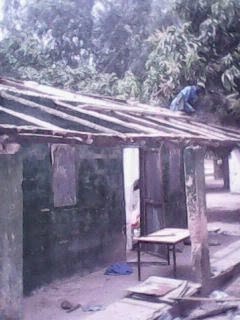 These have suffered from lack of maintenance over the years (other projects have received priority funding) and two of the school's classrooms are currently out of commission and the teachers' accommodation is in a pretty dreadful state. Having spent a great deal of time examining the options and costings we decided to make our largest single donation to get these fixed. We have allocated almost £500, which will be spent between now and the start of the rainy season (June) on upgrading and making habitable these facilities. Two classrooms will be restored, and brought back into use, thus alleviating crowding in the other rooms - which accommodate up to 70 pupils in each class. The repairs to roofs and walls in the teachers' accommodation will make them dry in the pretty torrential wet season and offer a little comfort to ten teachers and their families - though they are yet to get electricity there - one of our medium term objectives. Below are a few photos of the "before" renovations. In a month or so we hope to be able to show the impact that just £500 will have made to potentially 150 students and ten staff and their families. We are hugely indebted to two other great UK charities, and their supporters for their assistance with this item. Kit Aid (who mop up surplus and redundant football kit from clubs over the UK and ship it to third world countries - patron ex-England manager, Graham Taylor) and our very good friends at Football Gambia provided us with over 100 sets of football kit for the pupils at the senior school in Sohm this year. They, in turn, had been given them by: The Scottish FA, Cardiff City FC, Letchworth FC, Marriotts School and Watford Grammar school. We can't thank them enough, on behalf of Sohm's youngsters. We grabbed some "posed" shots of the kids wearing the kit, while in the village in February - see below. We hope to be able to show you some "action" shots of the kit in use, on the football pitch in a later edition of this newsletter. donation, via Kit Aid, to Sohm School. Last year, as a result of an extremely generous single donation, we were able to pay for a school visit for all the year 5 and 6 pupils in the junior school. For many this was their first visit out of the village, and certainly for most the first time they had visited the country's capital. Unfortunately there was a "malfunction" with the camera that was used to record the day, but the essays the youngsters wrote on their return are a joy to read. The photo below is of just a few of them. On their trip they visited the country's only commercial airport, the country's capital, its national museum, Arch 22 (the equivalent of Marble Arch - complete with a lift, which astounded many of them) and a visit to the Gambia Radio and Television studios. It's a shame we can't give even a flavour of the delight and appreciation these youngsters expressed for what was quite literally an eye opening experience for most of them. We hope you've enjoyed sharing with us some of the pleasure you and fellow donors have brought to this small, forgotten place. Your efforts are very much appreciated in the village, as we are told on almost a daily basis when there, and by e.mail etc, when in the UK. And, yes - money can go a very long way in a village where the average monthly wage is less than £30.